A circulated coin graded AG-3 (About Good 3) is very heavily worn, with portions of the lettering, date, and legends worn smooth. The date is barely readable. Rims merge into the lettering. A coin grading AG-3 will show significant wear that makes it almost unidentifiable. Most coin collectors try to obtain specimens that grade higher than AG-3. However, if budget restrictions prohibit you from obtaining a higher graded coin, obtaining a coin of this grade may be the only way for you to complete your collection. AG-3 is one of the lowest grades that a coin can be graded. There are only two grades that are lower: PO-1 (Poor) and Fair (FR-2). Additionally, coins can grade AG-3 and still have some of their lettering and rims well defined. However, the overall condition of the coin must be taken into consideration. If the obverse has extensive wear on it to the point where some of the lettering and the rim is worn smooth, but the reverse has a defined rim and clear lettering that could be graded as G-6, the coin will still be graded AG-3. This is because whichever side of the coin has the lower grade this will be used to assign the overall grade that the entire coin. Some coins may have details that may lead one to believe that the coin would grade higher than AG-3. But there may be problems on the coin that will push the grade to a lower grade than what your first impression may lead you to believe. This may include significant scratches or dings that will dictate a lower grade. The bottom line in grading coins is determining what the coin will sell for an open market. Remember, coin grading is subjective and what one person may think is an AG-3, another person may believe it is a G-4. There is no one correct answer since coin grading is an opinion and not a science. A coin graded AG-3 is extremely worn. 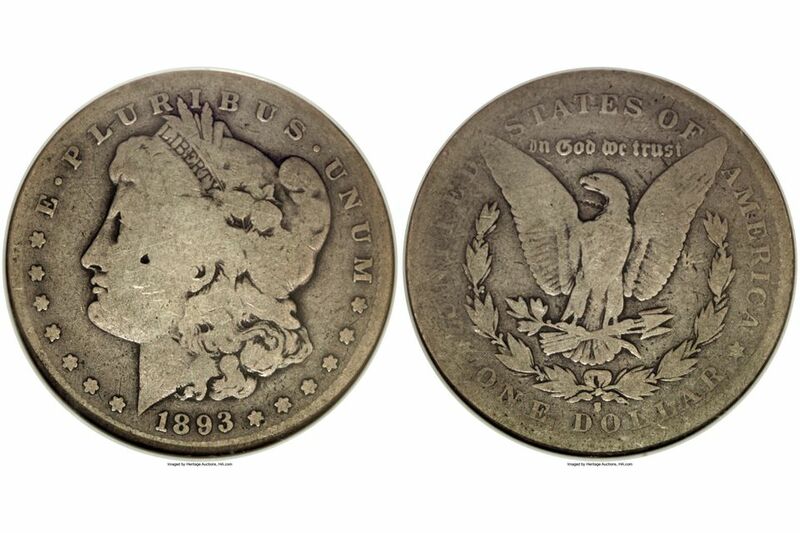 Much of the detail is missing, and the coin's type is barely identifiable. Additionally, the year and mintmark must be present. However, there are some coins where the year and/or date Mark have been worn away but can still achieve the AG-3 grade. This can be accomplished through diagnostics that remain on the coin. For example, the Standing Liberty quarter was first minted with Lady Liberty's right breast exposed. These Type 1 coins were produced in both 1916 in 1917. Halfway through 1918, the design was changed to cover Lady Liberty's breast. Additionally, the reverse design was modified to move three of the thirteen stars below the eagle. Unfortunately, the date was raised above the rim and was one of the first design elements to wear away. If the year is missing you can identify the type I coin by inspecting the reverse and looking for three stars below the eagle. If the three stars are missing, it is a coin that was minted in either 1916 or 1917. Since the date has been worn away, most people think it is impossible to identify the year of the coin. Fortunately, before they started producing coins in 1917, they modified the design slightly and added a fold to Lady Liberty's skirt. Even on well-worn Type I Standing Liberty quarters this fold will still be visible. A Morgan dollar that is graded AG-3 will have the letters along the rim merging into the rim.